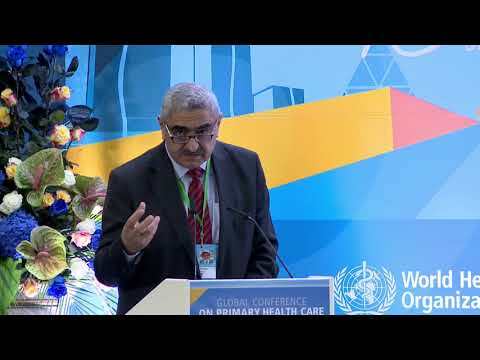 On 25-26 October 2018, the world came together in Astana, Kazakhstan, at the Global Conference on Primary Health Care to renew a commitment to primary health care to achieve universal health coverage and the Sustainable Development Goals. The Conference was held at the Palace of Independence and was cohosted by the Government of Kazakhstan, WHO and UNICEF. The new declaration renewed the political commitment to primary health care from Governments, non-governmental organizations, professional organizations, academia and global health and development organizations. It will be used to inform the UN General Assembly high-level meeting on UHC in 2019. Lebanon was represented by the Director General of Health, Dr Walid Ammar, and the Head of Statistics Department, Ms. Hilda Harb, together with a representative from civil society, Mr Serop Ohanian, the director of a Karagheussian primary healthcare center. Lebanon renewed the commitment to Universal Health Coverage through Primary Health Care, and, at a Ministerial Panel discussion, Dr Ammar participated in a roundtable and made a presentation on how this can be achieved through partnership for health with the private sector, including Non-Governmental Organizations, giving the example of Lebanon. The new declaration is also a chance to commemorate the 1978 Alma-Ata Declaration on Primary Health Care, and reflect on how far we have come and the work that still lies ahead considering the new challenges facing the Healthcare system.